Many cities lie on the sea shore. They are contributors to global warming because of the energy used to cool them and the "heat island" effect which makes them warmer than the surrounding countryside. Many people have heard of land-based geothermal heat pumps which use the ground's temperature to heat buildings, but now there is another use of temperature differentials: the use of cold water from the deeps to cool buildings instead of air-conditioning: this is called "Ocean Thermal". 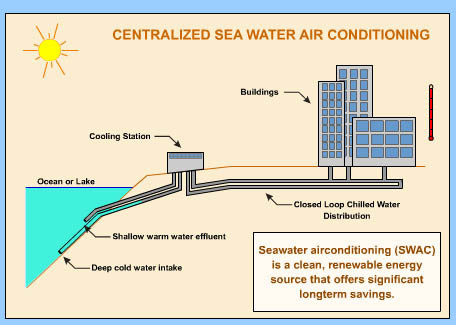 Essentially cold sea water is pumped up and around buildings to cool them and their occupants. This needs considerable investment in the pipes and equipment, but then cost savings can be made. It is claimed that Sea Water Air Conditioning is clean and environmentally friendly, and can save more than 90% of the energy used for conventional air conditioning. Its main requirement is that the structure to be cooled is near the sea, or another large body of water like a lake or reservoir. This technology is in operation in a few locations around the world including Cornell University in New York State, Toronto and Sweden. Other projects are in development in Hawaii and Bahrain.